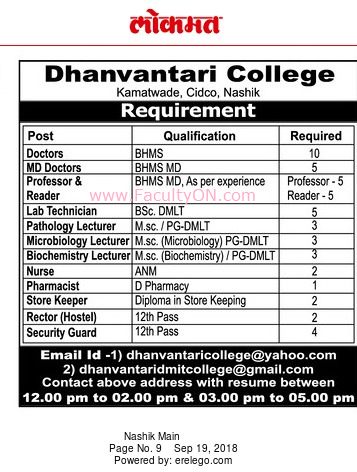 Dhanvantari College, Nashik has advertised in the LOKMAT newspaper for recruitment of Teaching Faculty- Lecturers / Professors / Reader Plus Non-Faculty jobs vacancies. 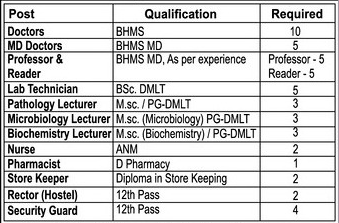 Interested and eligible job aspirants are requested to walk-in from 19th to 25th Sept 2018. Check out further more details below. About College: Our goal is to prepare you all to confront all adversities, confidently take challenges of the fiercely competitive business environment and in the long run come out as winners. Dhanvantari is one appropriate place where every child gets an equal opportunity to think, wonder, visualize, explore, experiment, take decisions and enrich itself through its experiences. This college aspires to meet the mounting needs of Society, Serve by developing future dedicated students/entrepreneurs of strong mettle and integrity. How to Apply: Interested and eligible candidates are requested to send CV along with copies of certificates and PP size photos to the postal address or email address given below.